Gildan is one of the world’s leading manufacturers of apparel, socks, and legwear. It ranks amongst the largest vertically integrated manufacturers of apparel and socks. Gildan’s geographic footprint extends to Canada, the US, Asia, Mexico, Central America, and the Caribbean Basin. The company has a presence across the entire value chain and operates through 7 yarn spinning facilities, 7 textile facilities, a garment dyeing facility, 12 sewing facilities, 4 sock / sheer manufacturing facilities and distribution centers serving 55 markets worldwide. Its portfolio of brands consists of Gildan, Goldtoe, Anvil, Secret, Comfort Colors, Silks, etc. Gildan has a large presence in the US, which can be measured by the fact that the company is one of the largest domestic consumers of U.S. cotton. The company produces enough yarn to circle the globe more than 600 times every day. Gildan consolidated its print wear and branded apparel business units and began reporting under one reportable business segment, starting in 2018. With three decades of experience, Gildan has built a rich heritage and is best known for its quality products. The company has become a leading household name given its growing portfolio of brands and a wide range of everyday basic apparel, including activewear, underwear, socks, hosiery, and legwear. Gildan’s vertically integrated manufacturing operations are situated in five main hubs. The company is also increasing its manufacturing capacity to address demand growth. Gildan’s vertically integrated model has resulted in efficient operations and cost controls. The company exercises good control over almost every step in the manufacturing process, right from raw materials to the finished product. It operates some of the largest and efficient textile facilities in the world. Nearly 90% of its total revenues are generated from internally manufactured products. 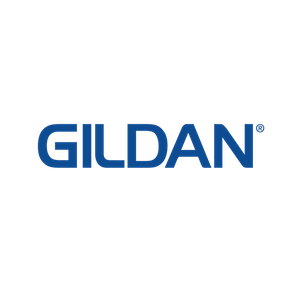 Gildan is focusing to benefit from the growing e-commerce trend and has opened a dedicated direct-to-consumer distribution facility, for its online customers. The company is also investing to increase its product presence on a number of major e-commerce websites. Gildan is leading the way to become one of the largest manufacturers of apparel and socks in the world, with more than $1 billion invested in technology and innovation since 2011. The company has been successfully capturing market share through international expansion in print wear, organic growth as well as strategic M&As. This has resulted in a solid footprint in both retail as well as global print wear markets. Some of the significant recent acquisitions by the company were Alstyle and American Apparel which are strong consumer brands and bring in a wide range of products. Gildan has raised its dividends since 2012, marking the seventh year of consecutive annual dividend increase this year. It also has a share repurchase plan and has returned more than $460 million to its shareholders last year. The company has also renewed its share repurchase program for another 5% buyback of stock. Gildan sports an annual yield of 1.5% and has a reasonable payout ratio of 43%. The company has grown its dividends at an impressive 20% compounded annually over the last five years. Strong sales growth across businesses has supported cash flow growth, especially in the activewear, fashion basics and international fashion categories. For 2019, the management is targeting long-term revenue growth in the mid-single-digit and earnings growth in the $1.90 to $2.00 range. The company has successfully demonstrated a solid track record of delivering strong results. It posted both top line and bottom line growth in the last year. A low cost manufacturing base has resulted in strong revenue growth and returns over the years. Gildan’s vertical integration, operational expertise, investment in digital growth and global reach should support dividend growth in the future. Large and small U.S. and foreign manufacturers are Gildan’s biggest competition. Companies like Fruit of the Loom, Inc., Russell Corporation and Hanesbrands Inc. manufacture out of similar geographies and compete primarily within the same basic apparel product categories. Garan Incorporated, Renfro Corporation, Jockey International etc. compete with Gildan in socks and underwear categories. In addition, the company faces changing market dynamics, in the form of growing online shopping, declining store traffic, retailer closures etc. A portfolio of well-known brands, manufacturing excellence, and global distribution capabilities form a deep moat around Gildan’s business. The company should continue its dividend growth streak on the back of strong sales growth of fashion basics, and activewear. Investment in technology, manufacturing capacities and business combinations position Gildan to better address the shifting market landscape.